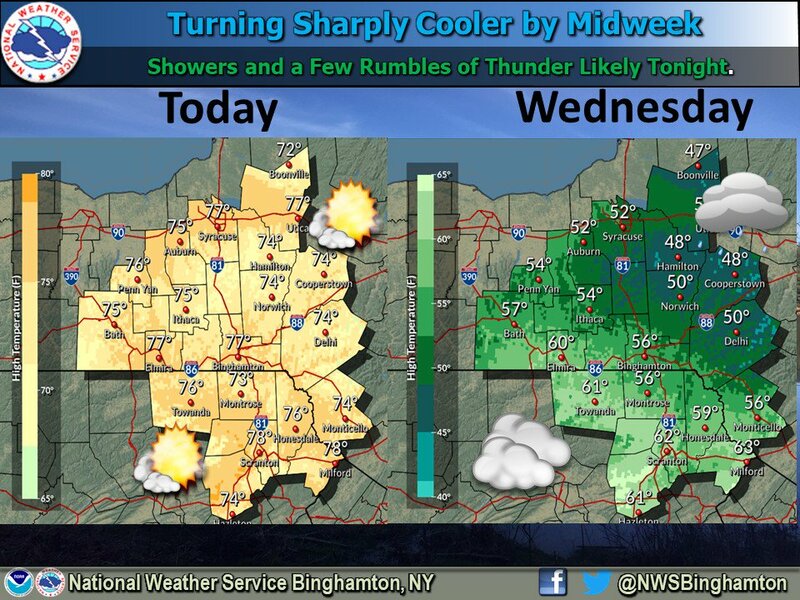 It may have been a pleasant, unseasonably warm day in the Finger Lakes on Monday, but things are about to cool off. Before the cool off takes place, the winds, which have been picking up throughout the day will reach their peak during the overnight hours. The National Weather Service has issued a Wind Advisory for most of the eastern and central parts of the Finger Lakes. Sustained winds between 20 and 30 mph can be expected, with gusts upwards of 50 mph possible through 6 pm on Tuesday. The strong winds will take care of most leaves that haven’t fallen from trees — but due to the severity of the winds, some minor damages to trees is also possible. The National Weather Service says that scattered power outages also cannot be ruled out. Those traveling should use caution, according to forecasters, who say that high-profile vehicles will be most-susceptible to the high winds. A period of moderately heavy rain will accompany the winds, which should subside by morning.